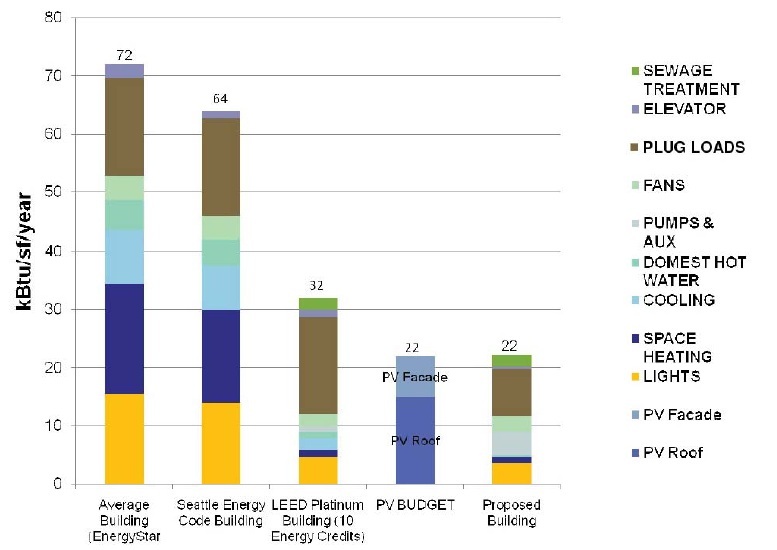 Cascadia Center for Sustainable Design and Construction: Can solar really work in Seattle? The Bullitt Foundation, one of the Northwest’s leading environmental organizations, has teamed up with local developer Point32 (BelRoy, Art Stable) and architects Miller|Hull (1310 E. Union, Garfield Community Center) to construct one of the most energy efficient building in the United States. And what lucky neighborhood will be home to this building? Well, three actually. The building, called the Cascadia Center for Sustainable Design and Construction, will be at 1501 Madison Ave, current site of C.C. Attle’s and a surface parking lot. 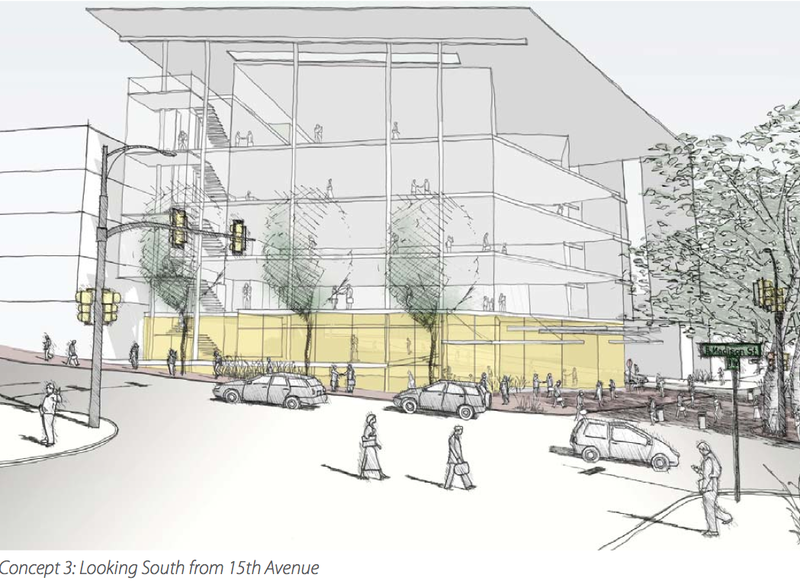 While technically part of the Capitol Hill Urban Village, the site also abuts the Pike/Pine neighborhood to the West and the Central Area to the East and South. The Early Design Guidance Meeting for the project is set for this Wednedsay, March 17th at 6:30pm at the SU A&A Building, 824 12th Ave [map]. You can download the full EDG Proposal here. Below is a quick preview of the project. Going beyond LEED Platinum and the 2030 Challenge, the project aims to meet the goals of the Living Building Challenge, a rigorous set of 20 priorities not least of which are 100% on-site waste management and renewable energy generation. Perhaps the most prominent feature of the building will be a huge Photovotalic (Solar Panel) which will cover the entire roof and South side of the building. Chris Rogers, CEO of Point32 said that many people are skeptical about solar in the Puget Sound region, but this project hopes “to prove that the Northwest is a viable place for solar energy”. Nonetheless, it will be challenging. They expect to produce roughly 22 kBtu/sq/year, nearly a 1/3 less energy than the requirements for a LEED Platinum building. Rogers said that they hope future innovations will provide them with more efficient PV panels, but until then building covenants will limit the energy usage of tenants. So sorry folks, no bakery at this site (Rogers says they use too much energy for baking). The idea is to make the project a model for sustainable design with a host of progressive organizations and companies residing in the building and a number of features that will allow the public to learn and interact with the building. Confirmed tenants include the Bullitt Foundation, which owns the property, as well as the Cascadia Chapter of the U.S. Green Building Council, and the International Living Building Institute itself. The building will also contain a number of publicly accessible data reader boards which will display real-time energy usage. They also hope to host on-site classes to teach people about the design and construction process. Another interesting feature of the building will be it’s interaction with McGilvra Place, the small “park” just to the West of the building site. 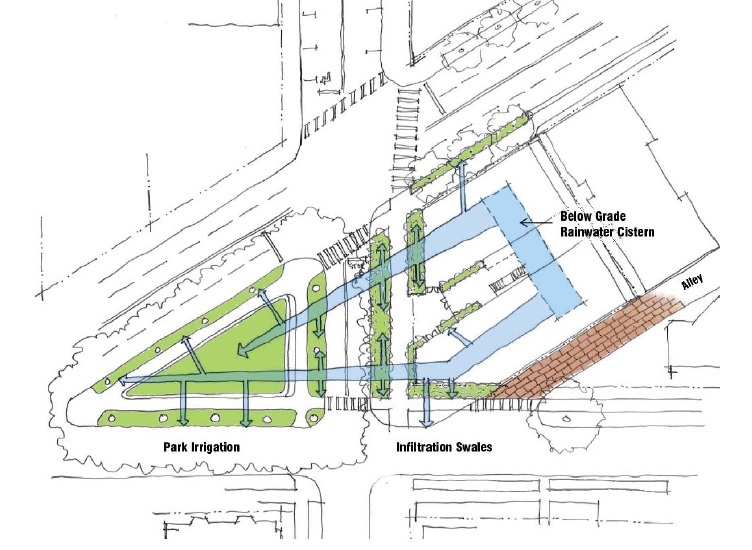 Plans call for a small public plaza at the 15th Ave entrance which will integrate with and enhance the current 2,600 square foot green space. They also hope to incoporate their wastewater and stormwater treament system into the park to maintain the 100 year old sycamores as well as other new native plantings. This aspect is currently pursuing funding through the Parks and Green Space Levy Opportunity Fund. Since it is still early in the design process, little is solidified on the physical look of the building. The photovotalic panels on the South side will be a major feature. Other than that, the team hopes to create a building that is uniquely Northwest by using local products and architectural elements. The proposal states that the team is “inspired by natural trees, filtered light, flowing water, and graffiti“. I dont know, call me crazy, but it seems we have for rent/for sale signs ALL over cap hill/madison/central disct/First hill. So who is going to live in this buidling and once again, I am sure it a building that will not offer rents that the average Cap hill resident can afford. Sorry I should have been more clear. The building will be 100% office/commercial space. I could not get a confirmed number to date but the developer has said that feel very confident about leasing the space prior to completion. With so many projects in an indefinite hold pattern I for one am really hoping this building happens. This seems like an exciting development for the neighborhood and city at large. Increased density always trumps attractive design in my mind, however much recent development is so very uninspired and uninspiring, whereas this project’s principals appear to be aiming for the opposite. I also welcome the jobs proposed to be housed here. My opinion is that this will be a real beneficial addition to the neighborhood if it gets done. also: As much as an institution C.C.Attle’s is, bars with parking lots bum me out. Try reading the article before getting so indignant. What part of “Cascadia Center for Sustainable Design and Construction” made you think it was going to be a residential building? I couldn’t agree more. I really hope this project happens. I walk by this site on my way to work everyday — I’m looking forward to watching it come together. Agree with Residual, innovative project for the city and our ‘hood. Very cool! Especially like the use/expansion of the park area to the west. I didn’t see mention of target date for completion — would they offer a year or range of years at this stage? Click on the “Design Proposal” link instead. I think completion date depends on the Design Review process, but they are shooting for beginning construction late this year. GREAT BUILDING!! Not only does it showcase green technologies, it only has parking spaces for four flexcars. The most important green/sustainable feature in hydroelectric Seattle is the lack of a parking garage, and that doesn’t cost a thing. WE DO NOT NEED MORE COMMERCIAL SPACE IN THE AREA! Hello!! Look around at the street level of most of the new buildings in the area. Do you notice all of the for lease signs in the lower commercial spots? Do we need more? The development of the six-story, approximately 50,000 sf commercial building will set a new standard for performance-based design and advance new approaches for sustainable construction.